The star at Skyline Serpentine Prairie was the abundant bloom of California Poppy. The best area for flowers was the hillside below and outside the downhill side of the fence. 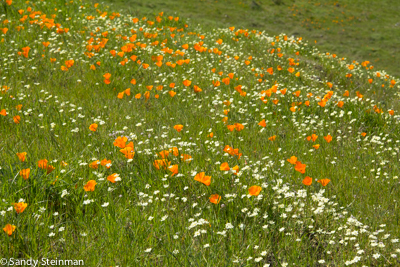 There were good displays of Poppies with Cream Cups and California Buttercups. There was also some Plectritis and Red Maids mixed in. Other flowers in bloom were Blue-eyed Grass, Goldfields, Purple Sanicle, Hog Fennel or Yellow Lomatium, Winter Vetch, Filaree, a small Lupine, a Ceanothus and a Salvia. Although I was mainly looking at flowers, I saw or heard Western Scrub Jay, Wrentit, Raven, American Crow, Northern Mockingbird, Anna’s Hummingbird, Western Bluebird and Anise Swallowtail Butterfly. Here are some photos to give you an idea of what I saw. I was there at midday with bright sun and some wind. A nice day for being out and seeing flowers but not for photography. Learn more at Skyline Serpentine Prairie an article by Steve Edwards the former director of Regional Parks Botanic Garden.